Colin Neale 1926-2016. An appreciation by the club FCCOC. FCCOC are very sad to hear of the death of our club-cars’ Chief Stylist, Colin Neale at home in Northville MI, USA on Sunday 14 August 2016. Colin was 89 and born in Birmingham, England. He designed among other cars the UK-built Ford Classic Model (109E / 116E ) with both British and American management influences, as a medium-size European and Commonwealth market car with his team working to a Ford product plan over the period 1956-57. The Capri , code named Sunbird , was a styling team morale booster initially conducted over about a week in 1957 with little or no reference to management, after sawing the roof off Classic’s recently approved two-door Clay. To an extent it was a Concept car. Colin always delighted in describing its eventual production in steel as “Happenstance”. Simply that Sir Patrick Hennessy, Fords UK CEO, liked the Clay version of Sunbird so much he found ways and means of forcing it into production as a Halo Car (i.e. to raise interest in other Ford products, as well as itself), on the back of the 109E saloon programme (Classic or Consul 315 in overseas markets). A rare example of Styling leading Production in the volume-automotive industry. This Consul Capri (as Fords second most expensive model) had great feminine appeal and as first sold, was briefly a trophy for Vogue-reading ladies of leisure in the early 1960’s as well as Women with proper jobs of the day (Teaching, Architecture, et al) and aimed at exploring a coupé market among a certain proportion of men with professional jobs also being chased by Euro-manufacturers. It was given the Tag “First Personal Car from Ford of Britain” and gained additional credibility with the motoring press when the GT engine became available in 1963. (It is believed Sir Patrick himself had one maintained for his holiday “appraisal” in Ireland and continuously modified to keep abreast of mechanical intentions). 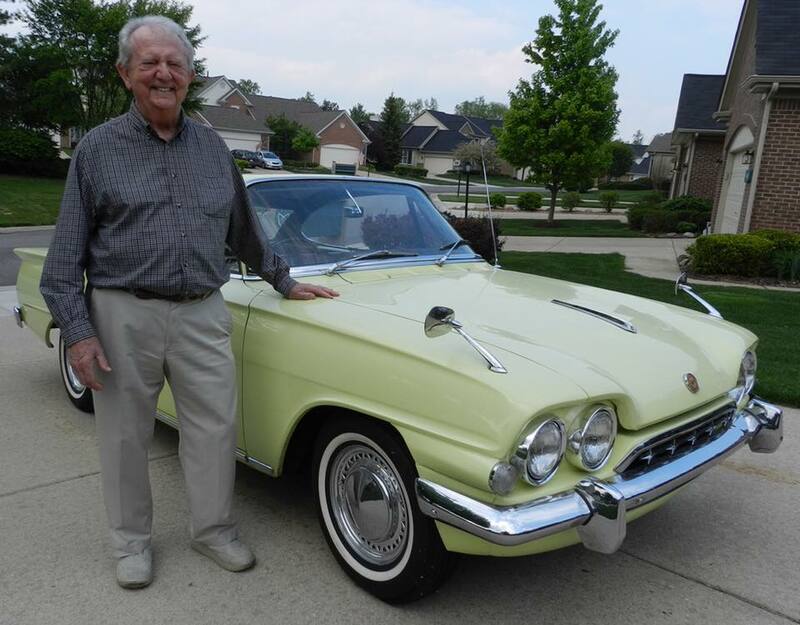 Colin made new careers in America from 1958 onward both with Ford until 1962, where the scope for design diversity (and standard of living) was much greater, and then Chrysler up to 1977 where he was initially head of Interior Styling . He then went into independent design practices until he was 80. Colin has over the past ten years or more shown considerable moral support for FCCOC and its club magazine Classic Capri Review. And been genuinely impressed at the interest shown in his later UK cars by the individual club members making up FCCOC , restoring their own cars and meeting at shows. He actually had a surviving Consul Capri GT exported to USA for his personal use and drove it in the annual Woodward Dream Cruise (in greater Detroit). What is perhaps forgotten is that in his “young-Turk”, & “big-fish-in-a-small-pool” days at Ford Dagenham, he designed cars which would eventually come to dominate the British street scene for ten years and still be statistically visible even when he left Chrysler, twenty years or so after penning and modelling them in Clay! There is a legacy of this in British film, television and contemporary street photography. Not to mention the toy boxes of children given contemporary die cast car models (by Dinky and Corgi, etc) to play with. “Its a Ford show, Its a Classic Show”. Colin was the first to acknowledge that full-product Car design always involved a team of thousands, including all those in engine and chassis development, but in many respects this was also “all his own work” ! His actual contribution was even greater with the 100E to 107E range of “Popular” small cars being styled in his time plus commercials such as the Thames Trader lorry cab. Colin drew the best of Fords 1950’s American styling Tools into Ford UK and trained artists and sculptors to use them under his leadership. Thus his cars gradually draw away from engineers drawing-board shapes to three dimensional and aerodynamic preferences. It is notable that after his departure to Ford USA, part of Colin’s small but able UK styling team was poached by Lotus ! Others went on to dominate the Cortina and Corsair programme as their own careers developed. FCCOC would like to extend condolences to the Neale Family , particularly his wife Vida and his children John, Simon and Amy. But also those in Britain.